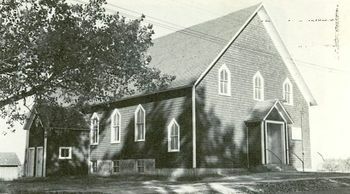 Fairview Mennonite Church in Fairview, Michigan in 1946. Source: Mennonite Community Photograph Collection, The Congregation (HM4-134 Box 5 Folder 1 photo 010.5-1). 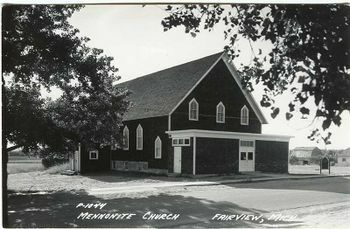 Fairview Mennonite Church in 1970s. Fairview Mennonite Church (Mennonite Church (MC)), located in the village of Fairview, Oscoda County, northeastern Michigan, was a member of the Indiana-Michigan Mennonite Conference. The church was organized with 35 members on 2 February 1904. Eli A. Bontrager was the first pastor. In 1953 the church had a membership of 391, under the leadership of Bishop Harvey Handrich. Other ministers who have served the congregation included Menno Esch, N. Z. Yoder, L. A. Kauffman, Moses S. Steiner, Floyd Yoder and Virgil Hershberger; the deacon in 1953 was Otis J. Bontrager. Menno Esch served as bishop 1909-1952 when Harvey Handrich became bishop. In June 2002 Fairview Mennonite Church withdrew from the Indiana-Michigan Conference and Mennonite Church USA and began an independent Mennonite congregation. The congregation had concerns about issues in the denomination, particularly over "apparent tolerance in the conference concerning homosexuality." In 2011 Fairview remained an independent congregation. The pastor in 2011 was Eldon L. Krider; the membership in 2009 was 259. "Three Churches Leave Conference." Gospel Evangel (July-August 2002): 2. Esch, Menno and Sam Steiner. "Fairview Mennonite Church (Fairview, Michigan, USA)." Global Anabaptist Mennonite Encyclopedia Online. January 2011. Web. 25 Apr 2019. http://gameo.org/index.php?title=Fairview_Mennonite_Church_(Fairview,_Michigan,_USA)&oldid=140662. Esch, Menno and Sam Steiner. (January 2011). Fairview Mennonite Church (Fairview, Michigan, USA). Global Anabaptist Mennonite Encyclopedia Online. Retrieved 25 April 2019, from http://gameo.org/index.php?title=Fairview_Mennonite_Church_(Fairview,_Michigan,_USA)&oldid=140662.